When the summer heat hits the valley and you need to get some perspective, hike the Grizzly Peak Trail. It is only about 10 miles from town, but the elevation affords a cooler outing for hikers and equestrians, and spectacular views of the area. The trail is accessible from late April to October, depending on the snow level each year. In 2002 a power line shorted out and started a fire in the East Antelope Creek watershed. The fire left craggy snags as a reminder of the losses from the fire, but take note of the successional species that have sprouted since the fire. Where the vegetation was more open, many species such as chokecherry, Brewer’s white oak, and maple have re-sprouted from their roots, but in the denser former forest stands, the fire burned hotter, and trees were killed down to their roots. Ceanothus was not present in this area before the fire, but sprouted up quickly, having awaited the fire to trigger germination. Drier, rockier areas are populated by annual species, and are growing much the same as before the fire. For both hiking and horseback riding, although it is a moderately easy trail, carry plenty of water, and be prepared for more weather extremes in spring and fall. As the trail loops around the mountain, enjoy unmatched views to the south of Mt. Shasta, west to the city of Ashland, and northeast to McLoughlin and Union Peak. Elevation at the trailhead is 5,200 feet; total elevation gain is 750 feet on the 3 miles to summit, or 5.4 miles around the loop. The whole loop gives a much better vista of the surrounding mountains. The north and east slopes of Grizzly peak are dense stands of a natural hybrid species of white fir and grand fir. Western slopes are a more open mixed forest of conifers and oak. This area is home to elk, deer, and our endangered Spotted Owl and the rare Great Grey Owl. Interesting Fact: Several flower species are present here, though unexpected, being outside their usual ranges. Rough leaved aster, several forms of sulfur flower, and a calochortus make a rare showing in this rich ecosystem. Directions: From Interstate 5, take the south Ashland exit number 14. Turn east away from town. Follow Highway 66 for less than a quarter mile. Turn left on Dead Indian Memorial Highway. Follow this road 7 miles to the Shale City Road, turn left at 38-2E-27. Follow the Shale City road about 3 miles and then turn left at road number 38-2E-9.2. 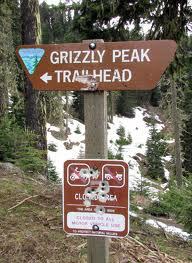 Look for Grizzly Peak trail signs. At almost 1 mile on this road, you will come to a three-way junction and continue on this road uphill. Follow the Grizzly Peak trail signs. Approximately 1.0 mile further, you will reach the trail head. Parking at the trail head will accommodate 10 cars. Bring a camera or binoculars to view the city of Ashland. Or try Geocaching – an outdoor adventure game played by global positioning system (GPS) users. Participants search for hidden containers, called geocaches, and then share their experiences online.